Serving and studying in Gurudev Siddha Peeth is an opportunity of great merit and worth. As the first ashram of the Siddha Yoga path, Gurudev Siddha Peeth holds incredible spiritual energy. It serves as a model spiritual environment for the Siddha Yoga Sangham. For Gurukula Students in Gurudev Siddha Peeth, the ashram daily schedule is the foundation for study and practice. Through focused and disciplined engagement with the ashram daily schedule, Gurukula Students continually invigorate the ashram environment and strengthen their sadhana. The spiritual practice of seva is a Gurukula Student's main focus.�In addition to seva, each Gurukula Student also engages in the Siddha Yoga practices of meditation, chanting, and contemplation.�By coming together to serve and study in this way, Gurukula Students imbibe the Siddha Yoga teachings and play a key role in contributing to the Siddha Yoga Mission. A Siddha Yoga practice of at least two years duration. Has served as a Visiting Sevite in Gurudev Siddha Peeth within the past five years. Is able to offer full time seva. Participation in at least one Siddha Yoga Shaktipat Intensive. 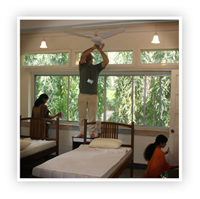 Participation in seva in a Siddha Yoga meditation center, an ashram, a chanting and meditation group, or at a retreat site. Understanding of and commitment to the practices, philosophy and culture of the Siddha Yoga path. An understanding of and love for the practice of seva. A strong desire to support the Siddha Yoga mission. A posture of studentship and a commitment to continuous improvement, ongoing learning and personal growth. Is able to dedicate minimum 6 months or more time to offer seva. Demonstrates fluency in written and spoken Hindi and or English: able to give and understand instructions and share experience with clarity.